AMBC has several projects in the works. The work that AMBC does can’t be completed without your help. Please consider becoming a member or making a donation towards a project. AMBC and Legacy Parks have been awarded a combined $15,000 grant from REI to help support development of trail at Stanley Lippencot Ridge Park. This tail connection will connect schools and neighborhoods as well as help develop a key connection from the existing Urban Wilderness trail system with Ft. Dickerson and downtown. AMBC is working to extend the Urban Wilderness network further South on private parcels. This will extend the mileage on the South end of the network as well as provide a hardwood forest experience on the periphery of the existing trails. 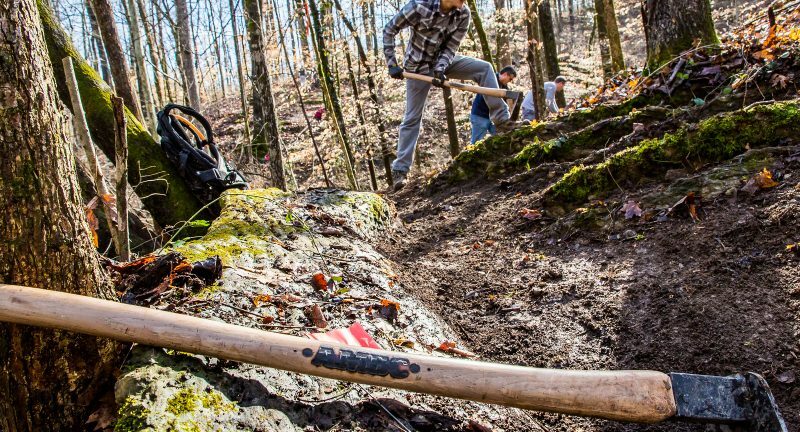 AMBC is working to assist the City of Knoxville in completing the bike park plan at Baker Creek Preserve. We hope to help build additional skills features that will complete the initial Trail Solutions concept and complement the new Urban Wilderness Gateway Project.